How efficient are Heat Recovery Systems? Of all the renewable and energy efficiency technology out there today, heat recovery systems are probably the most difficult to gauge when you are trying to decide how well they perform. Efficiency, that is how well a particular system captures waste heat, is highly dependent on the type of unit, make and model as well as the size and age of the property it is installed in. An older property will have more widespread heat loss issues because of the nature and age of the building whilst newer ones will have better insulation and up-to-date, greener systems. The kind of building will also make a difference. A swimming pool has a more open space compared to an office block where there are smaller, more contained rooms to consider. Another factor for the efficiency of a unit is how the controls are set to achieve the maximum effect and the habits of those who are resident in the property. A number of manufacturers boldly state that their system has a 90 or 95% efficiency which generally means under ideal circumstances, conditions that are not available to most of us. According to The Carbon Trust, the average range of efficiencies of heat recovery systems vary from around 50% to 80% as maximums. 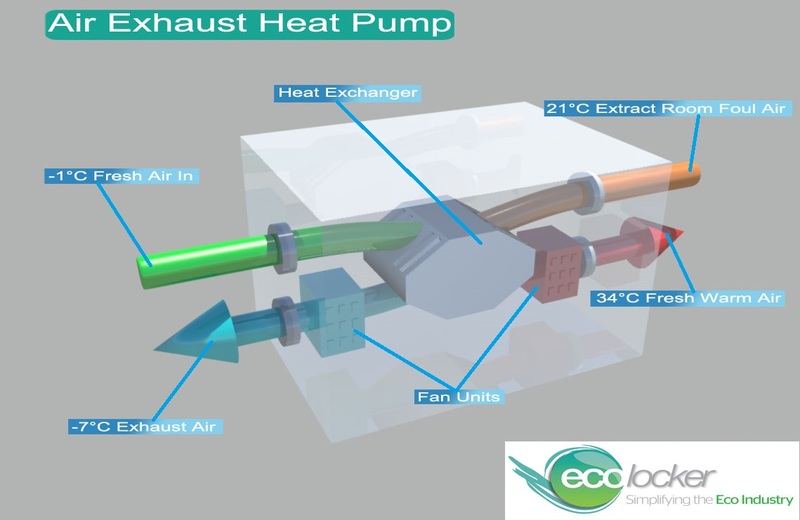 Heat recovery systems cover a wide range of applications from thermal wheels and recuperative technologies to underground heat pumps. You can find out more about the different types of heat recovery system here. Depending on how new they are, boilers are a major source of wasted heat, the older ones being the biggest offenders. Boilers that don’t use heat recovery systems can waste up to 18% of heat through the flue, and more because of issues such as insufficient lagging/insulation or poor maintenance that means a build-up of deposits. You can fit boiler flue economisers to minimise waste and they can save between 5 and 15% on your heat loss depending on the type of unit and boiler. It may seem counter-intuitive but there is often a significant amount of heat loss from poorly maintained or ageing refrigeration units. According to the Carbon Trust, fitting something like low grade heat recovery systems or a de-superheater for a larger system can offer good savings on wastage. In a supermarket, this could be used to supply between 75 and 90% of the hot water demand, simply from recovering waste heat from refrigeration units. Ventilation systems are used in a large number of places from domestic homes, office buildings, and shops to theatres, hospitals and swimming pool halls. The efficiency of these heat recovery technologies are a general guide and a lot will depend on other circumstances as outlined above. Thermal wheel ventilation units can deliver a maximum of 80% efficiency, and typical values can vary between 65 and 75%. Plate heat exchangers offer a maximum efficiency of 80% with normal variations between 55 and 65%. Run around coil systems boast a maximum of 55% with typical values between 45-50%. Heat pumps can produce 60% as a maximum, typically varying between 35-50%. Heat pipes can produce a fairly high efficiency rating of 70% with typical values between 50 and 65%. Figures courtesy of The Carbon Trust. As well as creating a better carbon footprint, having an efficient heat recovery system installed can present substantial savings for domestic residences, whether it be a ventilation system based in the attic or an external system such as a heat pump. Many new houses now come with some kind of heat recovery ventilation system that can save an estimated £200 a year on heating bills. There is an onus on businesses to cut down their carbon footprint and heat recovery systems provide a prime opportunity to do this. The efficiency of any system is going to depend on the age of the building and the type of system installed. New builds have state-of-the-art ventilation systems that can be highly effective in saving heat wastage. Older buildings may need more insulation to provide adequate savings, but a heat recovery ventilation system could, according to some figures, save as much as 30% on fuel bills. Perhaps the most important application of heat recovery systems is in industrial situations where large savings can be made from processes that produce a huge amount of heat waste. Gathering that spare energy is another issue and varies from a factory where heavy machinery is being used to factory processes that depend on high temperatures. The fuels used in these operations also vary considerably with steam, thermal oil and combustion being used on large scales. There’s no doubt that large savings can be made by industrial size businesses by installing effective heat recovery systems and they may also be able to take advantage of schemes such as Renewable Heat Incentive and the Renewable Heat Premium Payment.